An Apollo 11 space-flown US flag is among the top lots at Heritage Auctions' (HA.com) online sale, which ends on November 30. 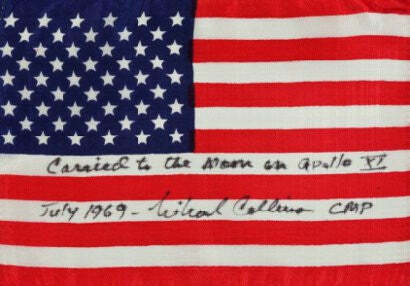 The 5.75" by 4" silk flag is signed by the often under-acknowledged third crewmember of the 1969 voyage, Command Module Pilot Michael Collins. It is inscribed with the words: "Carried to the Moon on Apollo XI/ July 1969 - Michael Collins CMP". The flag is estimated at $40,000 to $50,000, a valuation which we believe could be on the low side - especially considering recent blockbuster space memorabilia sales. Previously, non-space flown scraps of a US flag that was attached to Apollo 11's Lunar Module sold for $45,000 at an auction in 2010. The scraps were removed from the flag prior to the Module's launch. Because the flag for sale at Heritage was actually flown in space, we reckon it could sell for even more. Meanwhile, Apollo 11 autographs are among the most coveted and financially-rewarding collectibles around. 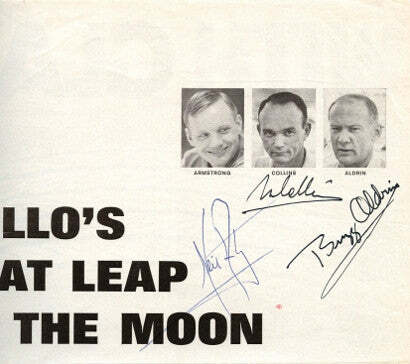 According to the industry's PFC 40 Autograph Index, the value of a photo signed by all three Apollo 11 crew members has risen by 6.15% in the past 12 months, and is now worth £9,500. Paul Fraser Collectibles has several Apollo 11 items in stock, including this remarkable signed magazine page, signed by Armstrong, Aldrin and Collins (pictured below). Neil Armstrong, in particular, is today the world's most valuable living signature - of any autographs niche, not only space - after he gave up signing in the mid-1990s. Because of the supply and demand economics which underpin the collectibles markets, items like the above - featuring all three Apollo 11 crewmen's autographs and not just Armstrong's - are becoming more and more valued as the years go on. Meanwhile, the HA.com sale will also feature an Apollo 13 Flown LM Systems Activation Checklist Book, estimated at $25,000 to $35,000. As usual, Paul Fraser Collectibles will bring you all the big results from the sale.